Peter and I looked at many houses last July on Cape Cod. Some were really nice, some were not really nice, and many were somewhere in between with things we liked and things we didn't. When we walked into this house that we ended up buying, I felt good there. It felt like the right fit, and this was especially notable because we really liked another house we'd already seen that was larger, newer, and in a neighborhood that we knew and loved. But for many reasons, this cute cozy house really felt like the right one for us. I'm so glad that we were able to get it. I think of it as our cottage on the Cape, and I'm sure that it will bring us, our families, and our friends many happy experiences and memories in the years to come. The house is in walking distance to the beach, mini golf, and ice cream. It's close to Hyannisport, with ferries over to the islands of Martha's Vineyard and Nantucket. It's close to some of the Cape's most well-traveled roads, but the neighborhood is peaceful and quiet. The house itself is not too big and not too small: it has four bedrooms, two full bathrooms, a living room, an eat-in kitchen, and an unfinished basement which we're finishing out to make into a family room and game room. I think it's the perfect size for us summer folks! The owners were selling the house with most of the furniture, dishes, bedding, and decorations included, many of which were very good quality, which was huge for us. The house is in good condition and doesn't need very much updating or repair work other than the basement, which doesn't even need to have anything done with it, we just want to. And it happens to be in the same area that we stayed in during the first few years that we started vacationing at the Cape, which to me was another sign that "this was the place." A note about these pictures. I took most of them after our offer was accepted when the owners still lived there, and some were taken after we closed and the house was ours. I don't have great pictures of every room yet, and there's a lot I still want to do to make the house our own, so periodically I'll post picture updates. Without further ado, here's the house! The flowered couch is being replaced by the couch below. The chair is also being replaced, and the boxy TV has been given away and there is now a flat-screen TV mounted above the mantel (see here for a picture). The next things I'd like to do are to get rid of the black TV table and replace it with a corner bookshelf unit and get new window treatments. I like this little window shelf in the wall between the living room and kitchen. It opens the two rooms up to each other a bit and gives a more open feel. Bedroom #1 on the ground floor. This is the master bedroom, even though it's not the largest bedroom in the house. This is how it looked when we bought the house, and it still pretty much looks like this, but I've replaced the bedding set and the curtains (see here for a picture). Bedroom #2 on the ground floor. 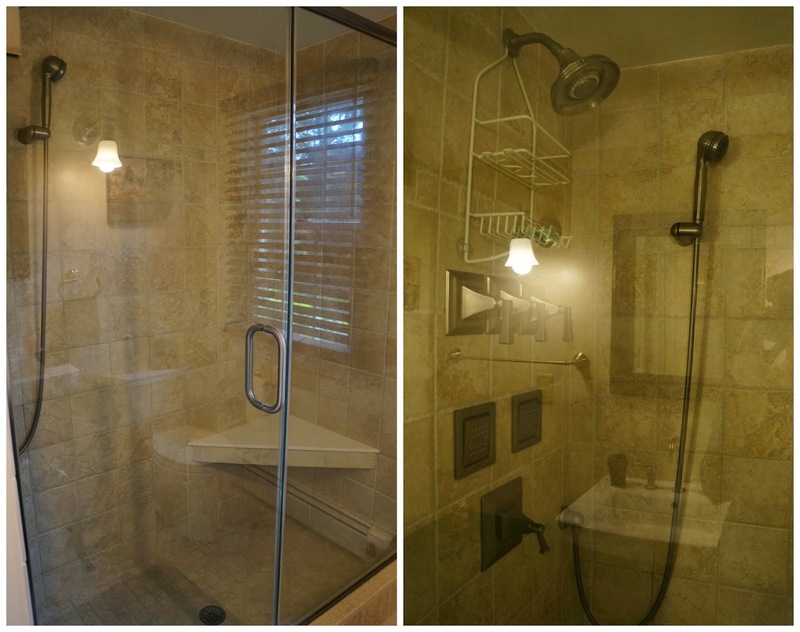 It was remodeled by the previous owners and has an amazing shower with jets in the walls! This adorable room was shared by two sisters. The owls in the room were further proof to me that this house was the one! The bunk bed was one of the few pieces of furniture that the owners were taking with them. Since buying the house, we've taken down the wallpaper and painted the room pale yellow (and by "we" I mean my mom), and we've moved two twin beds into the room. Sam made himself right at home in this room! The room now looks like this. I took these pictures when it was dark out so they're not nearly as flattering as the pictures above. As anyone who's ever bought or sold a house knows, take pictures of your house in the flattering light of day! The little hobbit door at the back of the closet opens to "the secret hideout room," as we call it. It's a great use of the space under the slanted front roof of the house. The girls who lived here before decked the space out with rugs and wall coverings and they left them there. It's such a fun place for the kids to play! I love the slanted wall eaves in these upstairs bedrooms. It's nice but a little too flowery and feminine for my taste, so this is the next room in which wallpaper removal, new paint, and some redecorating will happen. I want to give this bathroom a beachy or nautical theme. This is one half of it...the other side is pretty much the same and the washer and dryer are also down here. Wait until you see what this gets transformed into! The work starts on it next week. It's fenced-in and private, with trees and shade and a good-sized yard for the kids to play in. There's an outdoor shower stall, which is nice to have after a day at the beach or if you ever happen to want to take a shower under the stars or out in the fresh air. We also have our own hydrangea bushes! The brick patio is right off the kitchen. I envision many meals being eaten alfresco here in the summer! We got rid of the little raised garden plots because we won't really be able to grow anything in the limited time we'll have here each year. The backyard has lots of shade, so I'd like to get some good lawn chairs to put out under the trees. This is one of my favorite features of the house. I like porches a lot, even simple ones like this. I really liked these rocking chairs, but the owners took them, so we'll have to get a set of our own this summer. One of the things Peter wanted in a Cape house was a water view of either the ocean or a lake. Well, when you look across the street from the front porch and through the slats in the neighbor's outdoor stairs, you can see the inlet's water. I think this is way funnier than Peter probably does. Our house does have a water view, you just have to look for it! It's only about a 10-minute walk to the beach, maybe 15 minutes at the most with kids and beach gear. It's not a huge beach and doesn't have sand dunes or a wide-open view of the sea because it's a bay beach, so you can see out to sea, but the view is framed by trees and land on both sides. It's really pretty. The beach doesn't have a parking lot, which means that it probably doesn't get too crowded in the summer. It's between a summer resort's private beach on one side and private residential beaches on the other. It's not huge but it's a good stretch of public beach. We'll still go to the big popular beaches that we like that are around the Cape, but this one will be nice to have close by. Can you see the swimmer? And that's our Cape house! I'll post more about it in the future, probably after I travel out this spring once the basement is finished. I'll put together a before-and-after post for the basement, and I'll take good pictures of some of the bedrooms and other rooms and show the changes we've made. I'm thinking about starting a website or a blog just for the house. If you happen to be reading this and ever want to stay there, please let me know. We are very open to renting the house out for vacations at a very good rate to our friends and relatives and to people they know and trust!